This 100% polyester jacket is by Siasia New York. 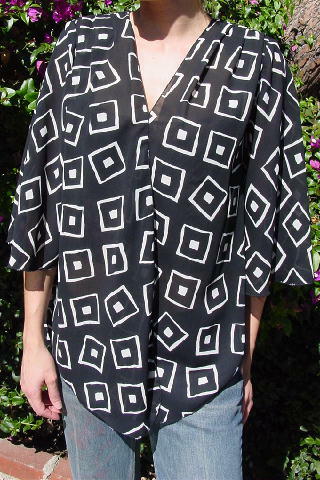 It has shoulder pads and two pleats extending downward in the front and back from each side-shoulder seam. 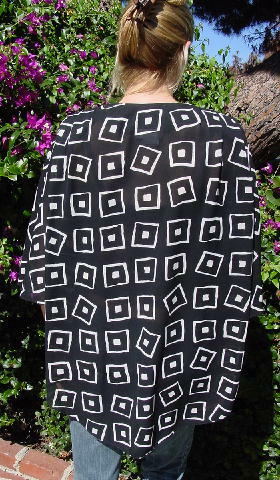 There is a black background with white geometric figures, 3/4 length modified bell sleeves, and shirt tails. shoulder to end of sleeve 17 1/4"
shoulder to front bottom center hem 29"
shoulder to back bottom center hem 33"
side to side bottom hem 33"